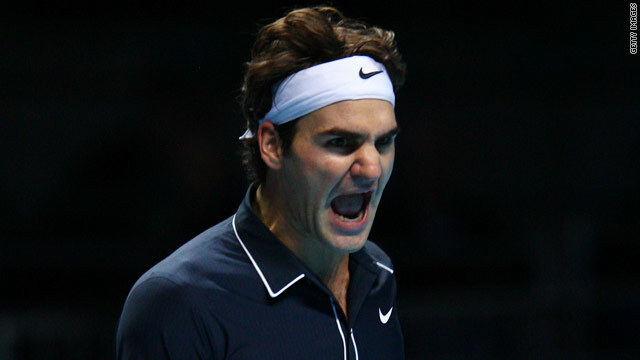 Roger Federer has now reached 23 consecutive grand slam semifinals after beating Nikolay Davydenko in four sets. (CNN) -- World number one Roger Federer reached his 23rd consecutive grand slam semi-final after overcoming his recent tormentor Nikolay Davydenko in the Australia Open on Wednesday. The top-seeded Swiss recovered from losing the opening set -- reeling off 13 consecutive games on his way to a stunning 2-6 6-3 6-0 7-5 victory. Federer, who is bidding for his fourth title at Melbourne Park, will play Jo-Wilfried Tsonga in the last four after the Frenchman won his repeat of the 2008 final against Novak Djokovic 7-6 6-7 1-6 6-3 6-1 in three hours and 52 minutes. Davydenko had beaten Federer in their previous two meetings and last week declared the top players were scared of him. The 28-year-old Russian looked like backing up those confident words early on as he cruised to the first set with two breaks of serve in 34 minutes. Federer took a toilet break at the end of the set but it did not slow Davydenko's momentum as he grabbed another break and was 15-40 ahead on Federer's serve. But the Swiss responded in the style of a champion to hold serve and begin a run of 13 consecutive games that sucked the life out of Davydenko's challenge. "I was in a tough situation -- I knew I wasn't looking very good," Federer told reporters. "But that's the beauty of best of five sets. I wasn't panicking even though I maybe would have lost the second set had I lost another point at that stage. I just relaxed and thought if his level drops just a little bit the whole thing might change for the better and it did. "I just relaxed and thought if his level drops just a little bit the whole thing might change for the better and it did. Federer admitted his relief at continuing his remarkable run of major semifinal appearances that dates back to his third round defeat by Gustavo Kuerten at the 2004 French Open. "It's incredible looking back on how many years that is now I'm able to deliver at grand slam play, especially this year," he added. Tenth seed Tsonga's victory over Djokovic in the night session quarterfinal was marred by a stomach bug that hindered the Serbian midway through the match. The 22-year-old at one stage needed to leave the court to vomit and from there his challenge petered out. "I had a little problems with the stomach even before the match," Djokovic told reporters. "I started feeling it a lot after third set when I just couldn't hold on. "After two games I had to go to the toilet. There was no other way otherwise I would throw up on the court. "I don't want to find excuses for my loss, but I went to vomit and I had diarrhoea before the match. It was just a terrible feeling."